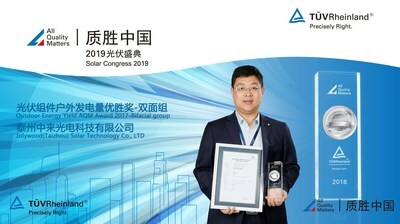 SUZHOU, China, April 1, 2019 /PRNewswire/ – Jolywood (Suzhou) Sunwatt Co. Ltd. (Jolywood) has won TUV Rheinland’s All Quality Matters Award in the Outdoor Energy Yield’s Bifacial PV Module category with its pioneering N-type high-efficiency PV techniques. The All Quality Matters Award, hosted by global industry leader TUV Rheinland, is an annual celebration of the outstanding contributions from manufacturers of PV modules, inverters, energy storage systems and components in Greater China, and has become a well-known barometer of trends in the PV industry. This year’s award ceremony was held in Suzhou, east China’s Jiangsu Province as part of the All Quality Matters Solar Congress. During the two-day event, Dr. Liu Zhifeng, GM of Jolywood (Taizhou) Solar Technology Co. Ltd, gave a speech on Jolywood’s N-type passivating-contact bifacial module techniques. After years of research and development of its N-type high-efficiency bifacial solar cells and modules, Jolywood has made groundbreaking achievements in enhancing conversion efficiency and reducing the levelized cost of energy (LCOE). One of its latest products, N-type passivating-contact bifacial cells, have raised the average conversion efficiency to over 22.5%, with front power of over 330W. Due to the advantages of raw materials and structure, the passivating-contact solar cell has a high efficiency improvement space compared to the perc solar cell, and has advantages like no PID, zero LID, better weak light response, lower risk of cracking, etc. High-performance and high-reliability enable higher long-term benefits and lower LCOE. To assure high quality, all Jolywood products must go through multiple outdoor trials before being approved. The All Quality Matters Award Committee acknowledged Jolywood after a year-long series of on-the-spot inspections of the module’s outdoor energy yield, once again demonstrating Jolywood’s persistence in excellent quality. Gaining a firm foothold on the international stage, Jolywood has also partnered with globally-renowned Datong Panda PV, and the Dutch-based 11,75MW Zonnepark Rilland project, which is the largest utility-scale solar power plant built with N-type bifacial solar modules in Europe. Jolywood (SZ: 300393) is the world leader in the development, production and marketing of PV backsheet, high-efficiency mono-crystalline n-type bifacial solar cells and bifacial modules. Founded in 2008, Jolywood (Suzhou) Sunwatt Co. Ltd. (Jolywood Suzhou) is the largest manufacturer of PV backsheet worldwide, with an annual production capacity of over 100 million square meters. Jolywood (Taizhou) Solar Technology Co. Ltd. (Jolywood Taizhou), a wholly-owned subsidiary of Jolywood Suzhou, was founded in 2016, topping the global solar industry with 2.4GW in manufacturing capacity of N-type bifacial solar cells since 2017.